In Chiayi County, the scions of two political families are pitched against each other. One is a political newbie, the other a seasoned street protestor, and they will have to prove that they are not puppets but able to pull a few strings themselves. As the January 16 general elections draw close, people are closely watching the campaign in the coastal region of Chiayi County in central Taiwan. 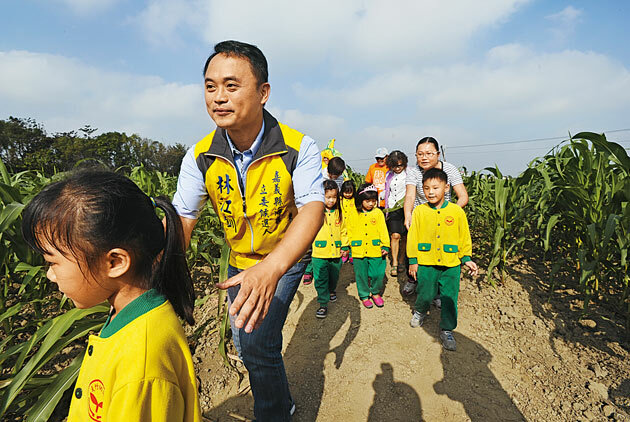 The county’s first electoral district covers the eight townships of Liujiao, Dongshi, Puzi, Taibao, Budai, Yizhu, Lucao and Shuishang, a rural area with traditional farm and fishing villages where kinship and close inter-personal connections count. And now the sons of two well-known local politicians are vying for the district’s seat in a red-hot race for the national Legislature. Democratic Progressive Party (DPP) candidate Tsai Yi-yu (蔡易餘), 34, is a lawyer and a son of former DPP lawmaker Tsai Chi-fang, who is affectionately known as one of the party’s "three clowns” in the Legislative Yuan. The Kuomintang (KMT) has nominated Vincent Lin (林江釧), 41, who, while a newbie to politics, is the son of two-time Dongshi Township Chief Lin Chun-chin and the nephew of Lin Shui-shu (林水樹), an influential local gang leader. What makes the Tsai-Lin duel particularly interesting is the two candidates’ background as scions of influential political clans. “I am a second generation [politician], he [Lin Chiang-chuan] is second generation too. If we weren’t, we would have to prepare for a very long time before we would be granted the right to run for legislator,” notes Tsai in early December as he goes from house to house in Puzi, canvassing votes. Certainly, being a political heir can markedly accelerate one’s rise into the higher echelons of politics. However, both Tsai and Lin did not volunteer to pursue a political career but were rather drafted by their families and political camps due to the lack of promising alternative candidates. Four years ago, the DPP realized it was facing an uphill battle in the 1st electoral district. If Tsai’s father, Tsai Chi-fang, were nominated to run for legislator, he would have great difficulty beating veteran KMT lawmaker Wong Chung-chun (翁重鈞), who also has strong grassroots support. So the DPP decided to draft the younger Tsai for the neck-and-neck race. In the end, the locally rather little known Tsai lost against longtime legislator Wong with a slim margin of just over 800 votes, sending shockwaves through the local political scene. This year, it is the other way round, as the KMT fears its chance for victory is slipping away given that KMT heavyweight Wong is not seeking reelection in his constituency. So the KMT drafted Lin Chiang-chuan as its candidate. “I can understand his (Lin’s) difficulties,” remarks Tsai junior, who in comparison to Lin has ample electioneering experience from his unsuccessful bid four years go. While Lin hails from a political clan, he has not yet had much to do with politics. He is a consultant to the Executive Yuan and helped his father when he ran for township mayor. Lin once also worked as a legislative assistant for Wong but has spent most of his career in the IT industry in northern Taiwan. After the KMT recruited Lin in August to run for legislator in his home county, his biggest headache was getting used to electioneering and the media limelight. As the Huang faction’s heir in the coastal area of Chiayi County, Lin is forced to put aside his personal preferences to take on this difficult mission of defending the political clout of his family and the local faction behind it. In Chiayi County, where local factions control and divide the spoils of power, the sense of crisis is high among KMT supporters. Since all polls show that DPP candidate Tsai Ing-wen is the likely winner of the presidential election, should the DPP also win the legislative seats in the county, the pro-KMT Huang faction will find it difficult to secure economic resources. “The vote captains for the other camp won’t be able to get any funding,” predicts a member of the Huang faction. Although Lin’s background is in the IT industry, his election headquarters reflect the county’s longstanding tradition of factional influence. The head of Lin’s election headquarters is his marriage witness – Legislative Yuan speaker Wang Jin-pyng. And a congratulatory couplet penned by Wang is displayed prominently on both sides of the door to the visitor reception room. While Lin has shouldered the heavy responsibility of securing the survival of the Huang faction, he also points out that his nomination came about in a hurry. “Legislator Wong said he would not run again, and the secretary general (Lee Kuo-sheng, secretary-general of the KMT party caucus in the Chiayi County Assembly) was also very reluctant, but everyone agreed that someone must be found to serve the farmers, fishermen and oyster farmers,” he explains. Unfortunately, the KMT’ s strategy for nominating party list candidates further undermined Lin’s election prospects. When the KMT announced its party list nominees in November, it caused outrage in Chiayi because Huang faction heavyweight Wong was not on the list. Local assembly members from the KMT led enraged supporters to the party headquarters in protest, threatening their withdrawal from the party, a development that was not particularly helpful for Lin’s campaign. Lin admits that he worries that if he does not win the election, the local farmers and fishermen won’t have a lawmaker to help them secure funding from the central government. Lin’s DPP challenger Tsai has to deal with his own yet somewhat different electioneering headaches. Tsai, who is a seasoned democracy activist, needs to morph into a lawmaker who fights for local grassroots concerns. After narrowly losing his legislative bid four years ago, DPP Chiayi County Legislator Chen Ming-wen (陳明文) saw to it that Tsai was elected chairman of the DPP Chiayi County party headquarters. However, as a National Taiwan University law school graduate, Tsai has always been interested in the big political issues such as fairness and justice. He has frequently joined anti-government street protests such as the demonstrations after the suspicious death of conscript Hung Chung-chiu in military detention in 2013 and the Sunflower student movement in 2014. At the same time, he has commented on current affairs as a frequent guest in political talk shows, which made him known nationwide. However, in local politics, inter-personal relations are most important, and the big issues are who to support in village chief elections or how to best serve local constituents. Tsai frankly acknowledges that these grassroots concerns are rather far removed from principled discourse over fairness and justice. Tsai also points out that rural county governments have relatively little fiscal resources. The rural areas therefore need to rely on their local lawmaker to draw attention to their needs. Securing fiscal resources from the central government and serving constituents are therefore the most important tasks of a lawmaker. “Subsidies for farming losses, dispute settlement, farming cooperative loans…these are all issues that need to be taken to the representative,” remarks a local politician from the green camp in summing up the public’s expectations toward their elected representative. Another even trickier conundrum that Tsai, the political heir, faces is how to emerge from the shadow of the older generation and come into his own. While Tsai senior has already retired from the political stage, “the elders” still meddle with the election campaign of the younger generation. Tsai and his father keep clashing over apparent non-issues such as the design of PR materials and promotional giveaways. One example is a foldable paper stand for smartphones that was designed by Tsai's campaign team. Reflecting the generational gap, father and son had opposing opinions when it came to decide what to print on the stand. While one wanted a formal photograph of Tsai junior with DPP Chairperson and presidential candidate Tsai Ing-wen, the other favored a cartoon version of the pair. In the end, they compromised to “put the photograph on one side and the cartoon on the other,” recalls an election headquarters staff member with a wry smile. Can a race between two political heirs bring fresh momentum into the 1st district? Lawyer Wellington Ku (顧立雄), who has been nominated for the DPP party list, believes that being a second-generation politician is not a bad thing as such if the political heirs have the courage to change the status quo and break away from the traditional mold to charter their own path. For Lin and Tsai that will probably be their biggest challenge.